Now in their third decade of existence, Metallica have come one of the greatest metal acts of all time. Selling more than 110 million records worldwide, their very name has become synonymous with the metal genre itself. 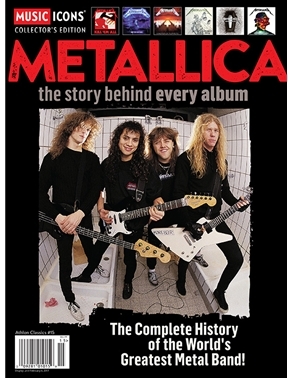 The Metallica story is a classic metal band saga, replete with revolving-door personnel changes, tragic death, trashed recording studios, career peaks and valleys and, of course, loads of the most thunderous, aggressive and heavy music the world has ever known. Metallica: The Story Behind the Album goes deep into each of the group's albums - from early classics like Kill "em All and Ride The LIghtning to their new masterpiece, Hardwired...To Self-Destruct - to reveal the outrageous stories behind their creation. Featuring dozens of never-before-seen photos of the group by the band's long-time photographer, Ross Halfin, this will be a "must-have" for the band's legions of fans.